The grass is a bit greener, the temps are HOT and the smell of football is in the air! That only means one thing…..TRAINING CAMP IS HERE! Saint Vincent College is ready to greet the hundreds of thousands of fans making their annual (or first) trek to watch their favorite team practice. Whether it is your time, or tenth-we have you covered with training camp details! Where to park, purchase great gear, eat and where to stay while in town is all here, courtesy of the Steelers. Please remember, training camp is a great time to obtain player autographs, but it is NOT a guarantee. The players are happy to greet fans and sign autographs, but their main focus is on preparing for the upcoming season. There are times when they are instructed by coaches to go straight to the trainer, doctor or meetings directly after camp so autographs are not always possible. There are also times when they have media, family or other obligations and they cannot stay and sign for fans. From what I have witnessed, and judging by the positive emails and photos I receive, the majority of the time the players do try to sign for as many fans as possible, but there are times when they simply cannot get to each and every fan. They greatly appreciate Steeler Nation’s support everyday at camp, and try to get to as many fans as possible, but they cannot guarantee autographs to all. 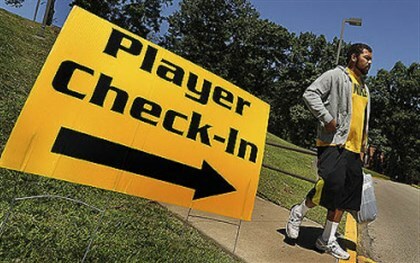 From the Steelers organization: The best time to obtain autographs from the players is after practice. There are areas designated for fans to stand to obtain the autographs. There is no formal setting for player autographs on a daily basis. Fans have always been great and very understanding, but I wanted to post a reminder.